Great giveaway! I am sure I would put the card to good use!!! Love the giftcard! Too cute!! This is a cute card! 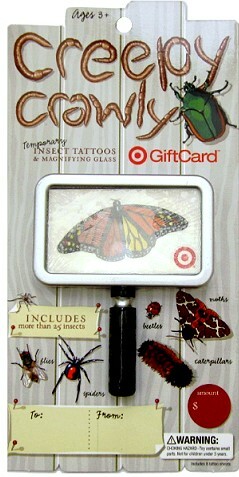 My daughter would love this…she loves bugs! Thank you for the opportunity! woohoo! Love this giveaway! Thanks! I love your site! Thanks so much!! Fun! We’re doing an animal/bug unit at school and this would be perfect to show my little Kindergarteners! Plus, nothing can be better than a Target gift card! I would love to win, thanks for all you do! I love your site. Thank you for helping us save money! I totally love you already on FB! Love your great giveaways! Thanks. Yes, I do already like Totally Target on Facebook. Awesome card; thank you for the chance to win!!! Thanks for taking the time to post such awesome deals! What a neat gift card! Nice thanks for all you do! it will be great to win.thanks for all your work. How wonderful! Thanks for EVERYTHING! You are much appreciated! Hoping I have good luck and win it! I love that you do this every week!! Consider myself entered! Love your site! Thank you. I already do “like” you on FB!!! Good luck, everyone! Thanks for another great giveaway! I am a Facebook fan. Thank you for all of your hard work!